On Saturday 23rd March 2019 Tom B. and Tom W. Travelled to Hereford to take part in an under 17 Bronze level tournament. In the boys singles Tom W. got through to the knockout stages and came away with a bronze medal. In both the boy’s doubles and mixed doubles Tom B. got through to the finals and came away with a silver medal in each. All in, a good medal haul. A week earlier Tom B. had travelled to Cheltenham in Gloucestershire to play in an under 17 Bronze tournament where he competed in the boy’s singles, level doubles and mixed doubles. 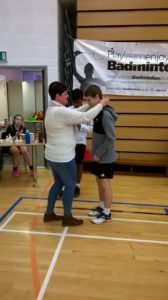 He came top in his group for both the singles and level doubles to progress to the knock out stages in both where he eventually took a bronze medal in the singles. Well done Tom and Tom! This entry was posted on Thursday, April 11th, 2019 at 6:13 pm	and is filed under Club Successes, Latest News, Match Reports. You can follow any responses to this entry through the RSS 2.0 feed. Responses are currently closed, but you can trackback from your own site.